Cozying up with this Vanilla Chai Old Fashioned. Homemade spiced chai simple syrup, mixed with warming bourbon, winter citrus, a touch of vanilla, and fizzy sparkling water. 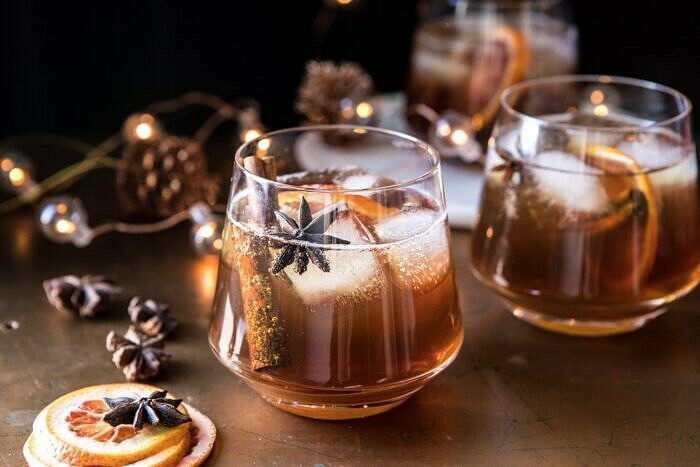 This old fashioned makes for the most perfect cozy fall and winter cocktail that everyone will love. Make the syrup ahead of time and keep in the fridge to mix up a quick drink in a moment’s notice. This will be your go-to this Thanksgiving. Welcome to the Saturday before Thanksgiving. For those of you who are cooking this year, I hope you’re spending the weekend prepping and getting organized. Which will make your Thanksgiving Day much more stress free. You’d think that’s what I would be doing, but instead I am spending the weekend working away and following none of my own advice. Typical. Unfortunately, I am a bit crunched for time this year, so I’ll have to worry about Thanksgiving on Thanksgiving. The good news is that I did remember to order my turkeys…did you? The other good news is that I have my menu set. And since I’ve already tested it many times over for the blog, I’m not too stressed. Actually, I’m very much looking forward to cooking all day on Thanksgiving. There will be no worrying about testing new recipes or taking photos. Hoping to bake a few pies with my mom, mix up cocktails for brothers, and just hang with my family. It’s been non-stop lately, so I’m really looking forward to a day with family and friends. As mentioned, all of my brothers will be here this Thanksgiving and four out of five of them love chai and love bourbon. So, I wanted to create a cocktail that would incorporate the two. I’m such a people pleaser, and I oddly just really love making cocktails for my brothers. Enter this vanilla chai old fashioned. 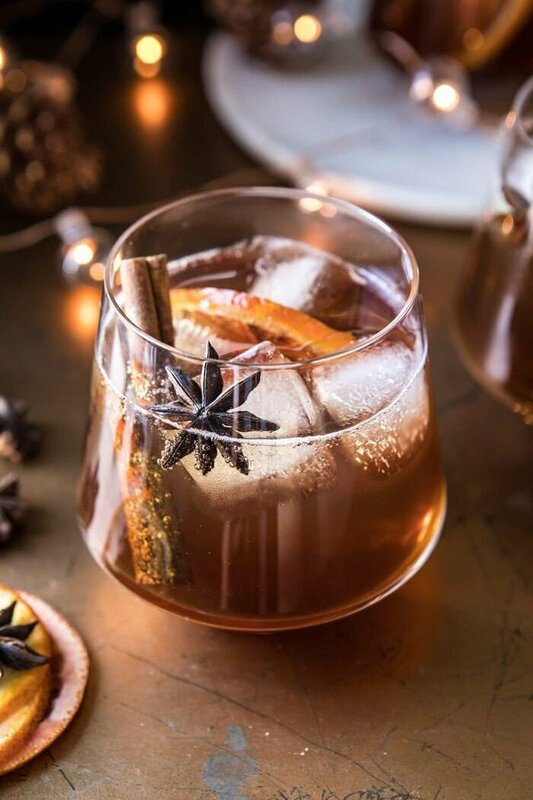 It’s truly one of the coziest cocktails, and it’s so good. Not too sweet, not too heavy on the bourbon, but just right and truly great for the Thanksgiving holiday. Start with the chai simple syrup. 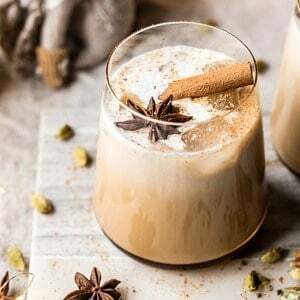 I first made this last year when I created this chai white Russian, which is another favorite holiday cocktail of mine. I quickly became obsessed with using the syrup in fun cocktails. It’s all the flavor you love from chai tea, sweetened maple, and spiked with hints of vanilla. Delicious. The syrup is the heart of the cocktail, and where a lot of the flavor comes from. In order to make this a true old fashioned, I added in high quality bourbon and a touch of citrus. 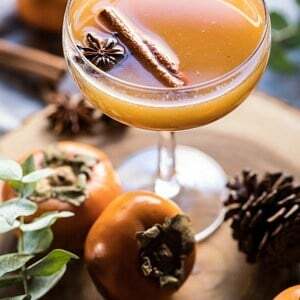 The flavors go so well, and like I said, it’s the perfect warming drink for cold nights. I highly suggest making a batch of the chai syrup this weekend. Then when friends and family randomly show up at your door you can just mix up cocktails. Which for me is very often. 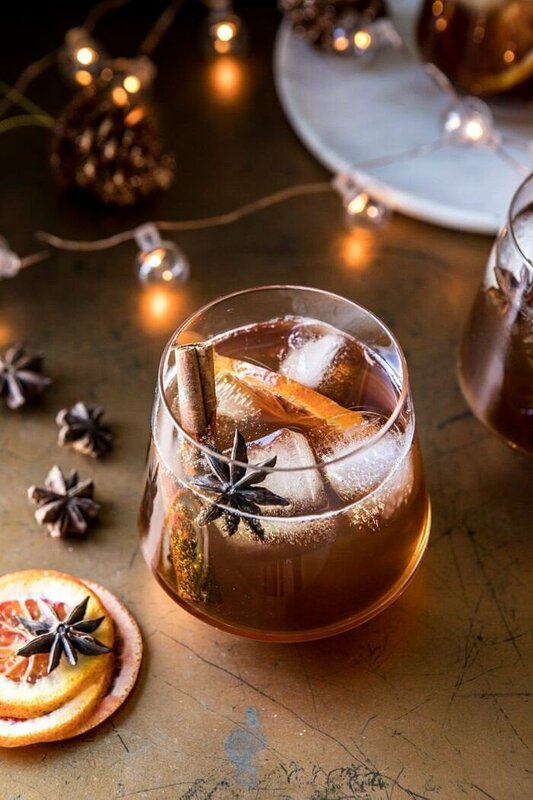 Nothing is more welcoming than a cozy cocktail. Well maybe a roaring fire, but that can sometimes be hard to come by. That said, if you can mix up this old fashioned, and stoke up a fire…ideal. If not, the cocktail, a candle, and good blanket will do! 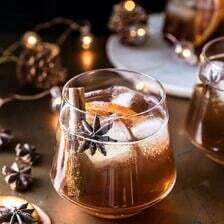 If you make this chai old fashioned be sure to leave a comment and/or give this recipe a rating! Above all, I love to hear from you guys and always do my best to respond to each and every comment. And of course, if you do make this recipe, don’t forget to also tag me on Instagram! Looking through the photos of recipes you all have made is my favorite! 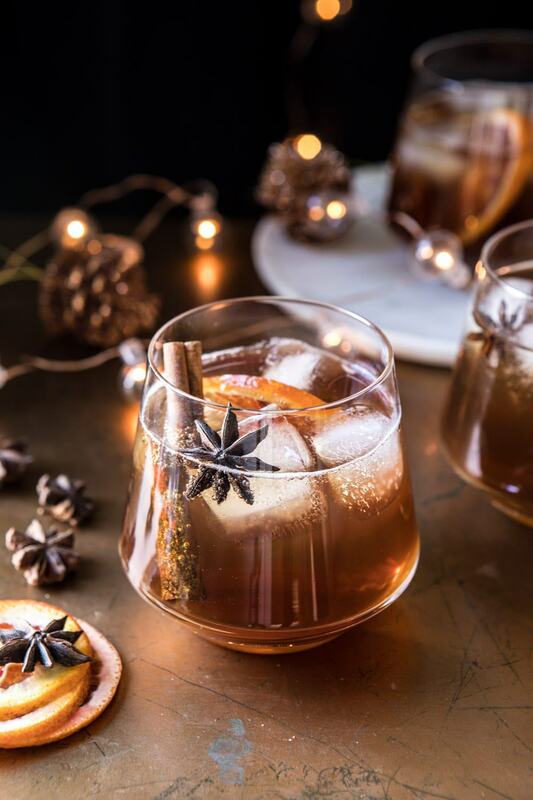 Homemade spiced chai simple syrup, mixed with warming bourbon, winter citrus, a touch of vanilla, and fizzy sparkling water. 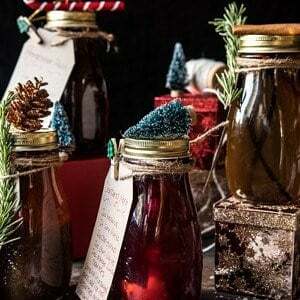 Make the syrup ahead of time and keep in the fridge to mix up a quick drink in a moment's notice. 1. In a medium pot, bring 1 cup water to a boil. Remove from the heat, add the chai tea bags, cover and steep 10-15 minutes. Remove the tea bags and add the maple. Bring to a boil over high heat. Boil 3-5 minutes, then remove from the heat. Stir in the vanilla. Let cool. Keep in the fridge for up to 2 weeks. 1. 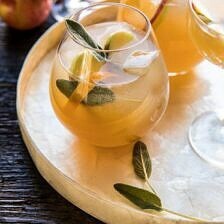 In a cocktail shaker, combine the bourbon, lemon juice, orange bitters, and 2 tablespoons of the chai syrup. Shake to combine. I’ve been waiting for this recipe ever since I saw it on your thanksgiving menu, it looks sooooooo amazing! Thank you so much! I am so glad you like this and I hope you try it! Is there a way to serve this warm? Could I heat it in a saucepan at the end? Will that taste okay? So beautiful, this is a must make for Thanksgiving! Is the syrup supposed to thicken up after boiling, or is it ok that it’s still relatively thin? I loved this simple cocktail. I made them the night before Thanksgiving for my boyfriend and I, and they were the perfect for snuggling on the couch and watching The Grinch. 🙂 The simple syrup was so easy and really tasty. I garnished with a cinnamon stick and a cranberry. 🙂 Thank you! That sounds like such an amazing night! I am so glad you both loved this drink, Brittany! Thats so amazing! I am so glad he loved this Brittany, thank you so much! I am so happy to hear that! Thank you Melinda! Do you think this would be OK with vodka instead of bourbon? Question….what kind of chai tea should be used? I found some vanilla chai tea in bags…or should I look for Just chai tea in bags?